These 25 most frequently asked questions are listed here for quick reference. You can find most of these answers in my Comic Chat Tutorials. These questions have all been submitted by friends who tried really hard to remember their first days in comic chat! lol If you don't know what 'lol' means, click here. If you would like to submit a question or if you have any comments, e-mail me. How long does it take to download Comic Chat? How big is Microsoft Comic Chat to download? How much space on my hard drive does Comic Chat take up? Can I uninstall Comic Chat? How can I tell what version of Comic Chat I am running? Why can't I connect to any Microsoft Comic Chat rooms? Why are all my characters black and white? How can I tell characters apart when there are duplicate characters? Where can I get new characters? Can I create my own comic characters? Can I create my own backgrounds? How does the emotion wheel work? How do I play a sound? Where do I put wavs? How do I stop sounds from playing? How do I whisper to someone? What do you mean by shouting......it all looks the same to me caps or not? Why does it say my ID is in use when I connect? How do I get more panels across the screen? What is the difference between Comic Chat and IRC (Internet Relay Chat)? How can I let people know I will be Away From the Keyboard (afk)? Q. How long does it take to download Comic Chat? A. Download times will vary depending on the speed of your modem, your internet connection and your computer. Q. How big is Microsoft Comic Chat to download? A. Comic Chat is a small program, 1.8 MB. Q. How much space on my hard drive does Comic Chat take up? A. Comic Chat requires about 4 MB of space. This could increase greatly as you add to your comic art folder. Q. Can I uninstall Comic Chat? A. Yes. Comic Chat can be removed by selecting 'add/remove programs' from your control panel. Go to your 'start menu/settings/control panel'. Select 'add/remove programs' and scroll down the list until you find 'Microsoft Chat 2.5'. Then click on 'add/remove'. This will remove Comic Chat from your computer. Q. How can I tell what version of Comic Chat I am running? A. To check your version, select 'Help' from the top tool bar and click on 'About Microsoft Chat'. The latest version, as shown in the image below, is 2.5. Q. Why can't I connect to any Microsoft Comic Chat rooms? A. Microsoft deleted all their Comic Chat servers in February 2001. Since Microsoft servers are the default servers for the program, you will have to enter new server information before it is possible to connect and start chatting. Mermaid Elizabeth has a list of current servers here. Q. Why are all my characters black and white? A. Microsoft Comic Chat 2.5 comes with black and white characters and backgrounds as shown below. If your auto downloads are checked, that will be quickly rectified. Or you can go to the character links below and choose a colour one. If you would like to replace your black and white characters with colour ones, Mermy has a colour replacement pack available here. Unzip these files into your comic art folder. Please note that they will over write the black and white characters. If you wish to keep the B&W ones, then either rename them first or move them to a separate folder to keep them safe. Many servers who cater to comic chat have rooms you can go to that allow you to download new characters and backgrounds. I once had a link here to a room that was such a room on chat.ircx-city.net, but since the original writing of this FAQ page, the server has gone off line. Please note that if you do click on a hyperlink that starts with mic:// you must have Comic Chat installed for the link to work. Q. How can I tell characters apart when there are duplicate characters? A. These days most people who use comic chat have unique characters but it does happen that you will see more than one of the same character in a chat room, especially assigned to chatters who use text mode. In the case of a text chatter, the computer selects a random character for them. If you see two characters the same, place your cursor over the character and a tool tip window will tell you the nickname of that chatter. Q. How can I change my character? A. Click on 'view' on your tool bar and go to 'options/character'. Scroll down the list and choose a new character. You can use this preview window and the emotion wheel to see what poses your character will display in a chat room by moving the black dot around the wheel with your cursor. You can also double click on your present character to bring up the same window or by using 'ctrl+q' and selecting the character tab. Don't forget to click on 'apply' so that your changes take place. Q. Where can I get new characters? A. You will get many characters and backgrounds if you have your auto downloads checked (view/options/comics view). See the image below. I have some posted on my site here, although many of these are in use by chatters and it is not polite to use a character that someone else has chosen. You can also search the web for more. However, if you want more or you want to choose one for yourself, you could do a search for comic chat characters or go to Mermaid Elizabeth's web site and check out her comic character links. Clickhere to learn how to save a character. Characters are saved in C:/program files/Microsoft Chat/comicart or C:/program fles/Chat/Comicart. Q. Can I create my own comic characters? A. Yes. If you would like to use the Comic Character Editor to make you own colour character, click here to read my Character Editor tutorial. Mermaid elizabeth has posted the original characters in black and white avs files that you can use to create a new character. Click here to download these files. Q. Can I create my own backgrounds? A. Yes. Any image that is in .bmp format can be used as a background. Use your favourite graphics program to design a background and save it in .bmp format. Save your background in your comic art folder (C:\Program Files\Microsoft Chat\Comicart). Click here if you need more detailed instructions on how to save a background. You can also check Mermaid Elizabeth's links for backgrounds by clicking here. You can change your background the same way you change a character by going to 'view/options/background' or by double clicking on the emotion wheel (or using 'ctrl+q') and selecting the background tab. Q. How does the emotion wheel work? A. The Emotion Wheel shows the range of emotions that your character will display as shown in the image here. To change the emotion drag the black dot around the wheel with your mouse or press the tab key and use your up and down arrow keys. MS Comic Chat Characters (if they are constructed properly) will automatically send an expression that matches what you are saying so unless you want to send a specific pose to the channel/room, you won't need to worry about the emotion/pose sent. For example, if you type 'lol', your character will display in a laugh pose. Not all characters will have a full set of emotions. This, of course, would depend on the concept of the original author of the character. To freeze your emotion or expression, right click in the Character Pane and select "Frozen". Q. How do I play a sound? A. At the end of your typing edit box there is an icon that looks like a speaker. Clicking on this will bring up your 'Play Sound' window (you can also use ctrl+H) shown below. Scroll down your list to select a wav. Then click on 'OK' to play the wav, 'test' to test it so only you can hear or 'cancel' if you change your mind. The standard 2.5 version of Comic Chat does not support the playing of MP3s. To learn how to convert and compress an MP3 for playing in Comic Chat, click here. I also have instructions there for making your own voice wav. Many chatters delete the default wavs that come with Comic Chat and convert their own or search for more. I have some wav's posted here. A Google search for wavs or sounds files will also produce good results. Other chatters will be able to hear the wavs you play as long as they have the same wavs on their computers, named exactly the same way. For example, if i have a wav called TADA.wav and you play one called !tada.wav, I will not hear it. Q. Where do I put wavs? A. The default path for wavs is: C:\Windows\Media. Click here to learn how to save a wav. If you wish to change the default path for wavs because you have yours stored in another location, go to 'view/options/settings'. In the 'sound search path' at the bottom of the window, use the menu to select your music folder. Q. How do I stop sounds from playing? A. Sounds can be turned off by going to 'view/stop playing sound' or by typing '/sound off'. Q. How do I send a file? A. Right click on a chatters name and select 'send file'. Browse to where you have the file saved. Q. How do I whisper to someone? A. It is often frowned upon to whisper to other chatters that you don't know so be careful when using this feature. The easiest way to whisper to someone is to use the third icon from the left in your typing edit box. Type your message, highlight a chatter's name and click on this icon. You can also press ctrl+w or type in /whisper [nickname] [message]. You can also use a whisper box which makes it easier not to misclick and send your whisper to the wrong person. To open the whisper box, right click on a chatters name and select 'whisper box'. You can choose to ignore anyone sending you whispers by checking the 'ignore user' box. You can also whisper sound files or wavs to someone by using the speaker icon in the whisper box. Q. What do you mean by shouting......it all looks the same to me caps or not? A. In comic chat there is no difference if you use caps or not, it all looks like caps. However, many chatters use text mode or other text based chat clients so they see caps plainly and it looks like shouting. Words written in all capital letters take longer to read since the eye tends to stop on each letter. Chat tends to be a fast paced enviroment so the use of caps will slow everything down. Q. Why does it say my ID is in use when I connect? A. Nicknames on an IRC server must be unique so if you connect and someone online is already using the nick you want, you will have to change yours. Many servers have nickname registration which protects your nickname from use by other people. Check the servers "Message of the Day" by going to 'view/message of the day' to see what services are offered. An easy way to keep your nick when it is in use is to alter it slightly by adding a ^ or a ~. For example I could use: Sniffles^^ or ~Sniffles. Q. How can I change my nickname? Q. How do I get more panels across the screen? A. The panel width can be adjusted by going to 'view/options/comics view' and using the drop down menu in the page layout area. The maximum is four panels wide. By using ChatCheck it is possible to increase your panel width to five. ChatCheck is a very kewl program that scans the internet for characters that are available, developed by Sqiz and administered by Mermaid Elizabeth. Download ChatCheck here. (I keep it in my Microsoft Chat folder). Click on the exe file. When the program opens, right click on a gray area and select 'MSChat panel width'. Make sure that ComicChat is NOT running a search when you change the panels. Q. What is the difference between Comic Chat and IRC (Internet Relay Chat)? A. Comic Chat is an Internet Relay Chat program that uses a graphical interface instead of plain text. Q. I need to answer the phone (answer the door, run to the bathroom). 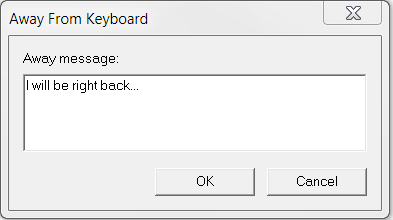 How can I let people know I will be Away From the Keyboard (afk) for a few minutes? A. Comic Chat is unique in that it has a visual away system that allows people to see that you are away until you return. Click the cup on your tool bar (11th icon from the left) and enter an away message (or type /away phone call brb....or whatever away message you like). This will place a coffee cup in the nickname list beside your nickname. When u return u can either click on the cup again to mark yourself as being back or type: /away. Q. What is a moof? A. A moof is an involuntary disconnection from the server. You have not been kicked out of the chat room and usually you can get right back. According to Cool Jargon of the Day, a moof is a term coined by MSN users to describe a disconnection.